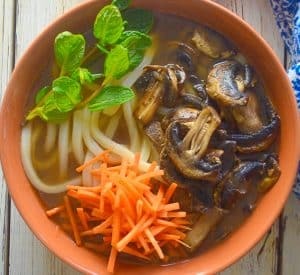 An easy Udon Noodle Soup that’s light, refreshing and packed with flavour. It makes a perfect low maintenance mid-week meal & once you’ve made that flavoursome broth you can really get creative with the toppings! It’s a bit of a soup meets salad kind of recipe. Sound weird? Well yes I guess it does, but it tastes amazing and is so fresh and healthy thanks to the mainly raw toppings. 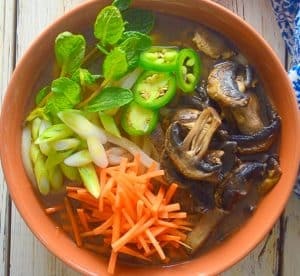 Have you ever eaten pho? This is a pretty similar concept, only it’s not authentically Vietnamese at all. 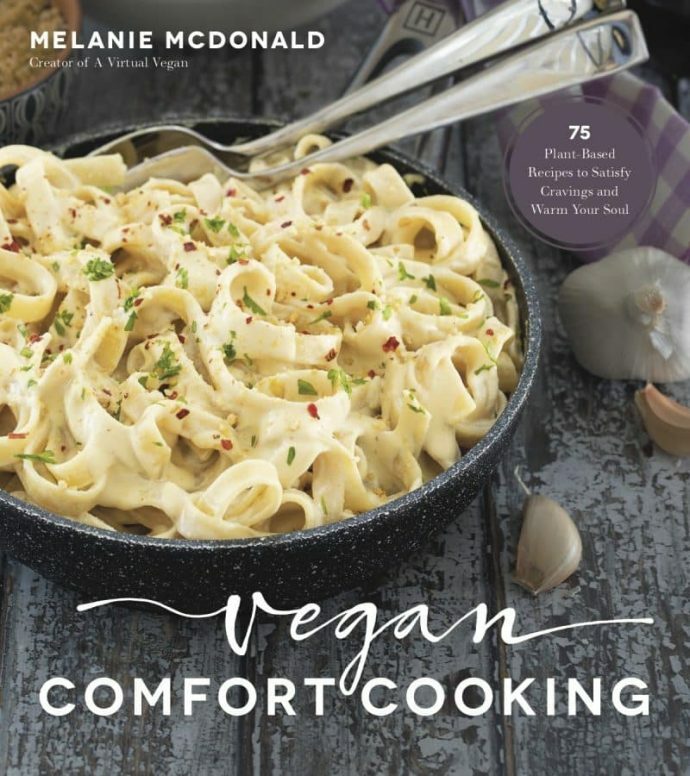 It’s more of A Virtual Vegan mash up, but in the nicest possible way! ???? 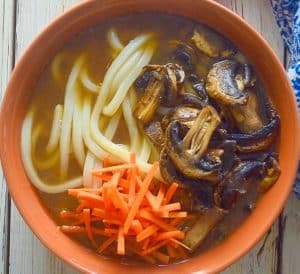 There’s a warm, fragrant broth covering the thick, hearty udon noodles, then the toppings happen. 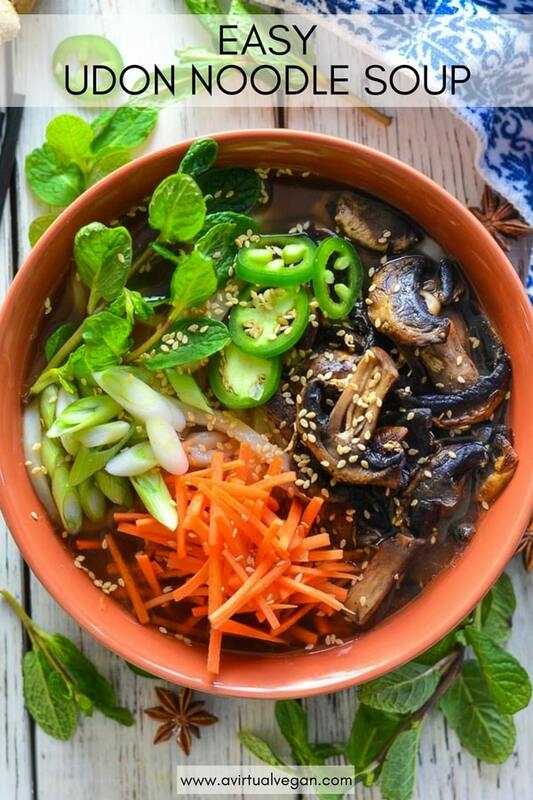 Here we have sautéed mushrooms, raw carrot matchsticks, green onion, jalapeños, fresh mint and sesame seeds. 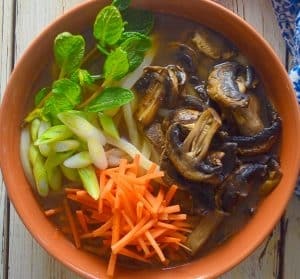 It’s a super easy soup to make, and although it does have a couple of exotic(ish) ingredients they are easy to find in just about any grocery store. First there is the beautifully fragrant star anise. You will find star anise with the spices in the grocery store. They look like pretty little stars (you can see a couple next to the bowl in the pic above) and they add such a lovely flavour to this broth. Secondly there is fresh lemon grass. You will find that in the produce section. It’s usually near the chilis or fresh herbs. 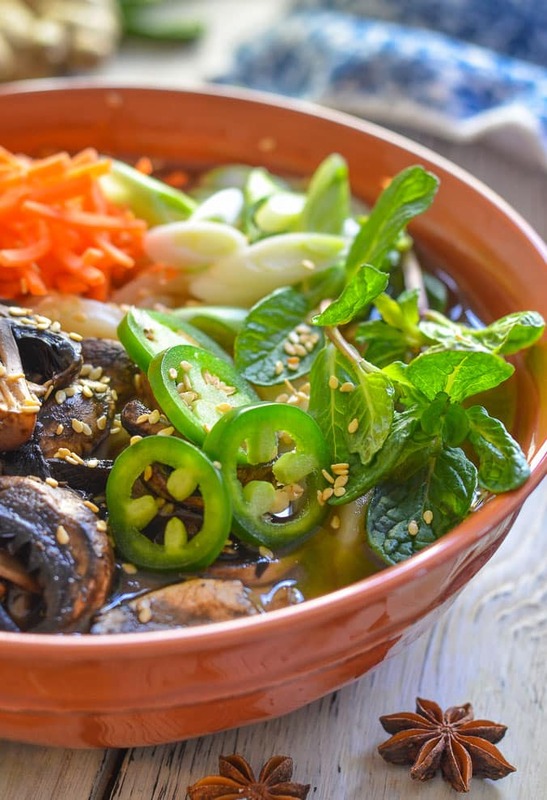 It has a subtle citrus flavour and adds a lovely bit of gentle, fragrant zip to the broth. And lastly there are the udon noodles. 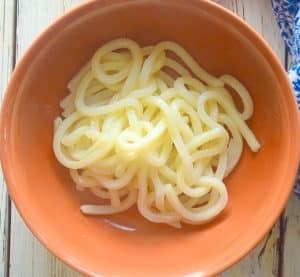 They are a really thick, Japanese noodle made with wheat flour. They tend to be available in fresh, frozen or dried form. Here, I usually find them in the freezer department. Any kind will do though. Just be sure to cook them as directed on the package. 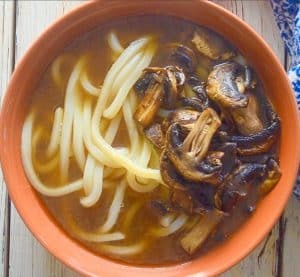 If you can’t find udon noodles, any noodles will work as a substitute in this recipe. Rice noodles would work particularly well, especially if you need to keep the recipe gluten-free. 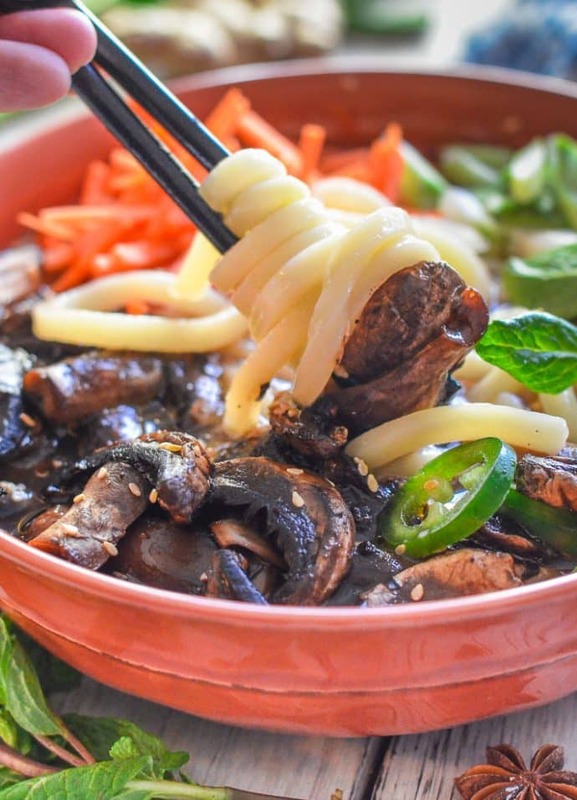 This Udon Noodle Soup is made in just a few easy steps. Make the broth by sautéing the onions, garlic and ginger. 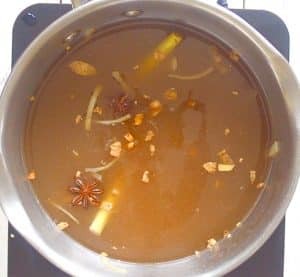 Then add the cinnamon, lemongrass and star anise, followed by the stock and tamari. Then simmer for 30 minutes to get those yummy flavours to shine. 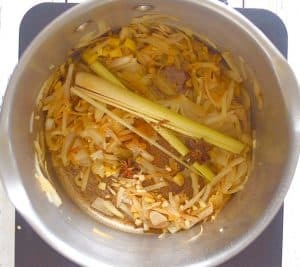 Once you have made the broth it will keep in the fridge for up a week and it freezes well too. It’s perfect for keeping on hand to make really quick and easy lunches or dinners throughout the week. Just cook some noodles, pour over the broth and top with whatever you’ve got in the fridge. Feel free to switch up the toppings that are included in this recipe. It can become a wonderful way to use up the sad veggies in the fridge at the end of the week, so get creative! 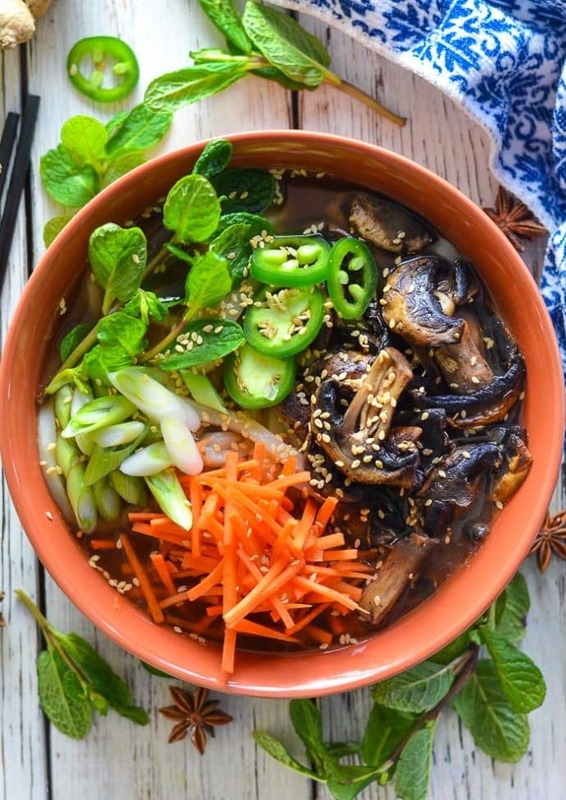 It can also be really fun to have all of the toppings prepared and in bowls on the table. That way everybody can help themselves and customize their own soup with whatever toppings they like best. To make it more appealing to children have some kid friendly veggies like peas and sweetcorn for them to put in their bowls. Toppings (quantities are just a guide. Use as much or as little of each as you like and feel free to add any extras. 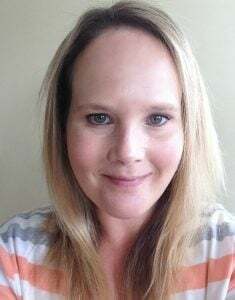 See my list of topping ideas in my post above. 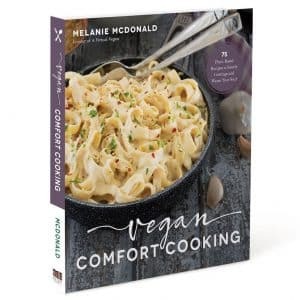 Warm a large pan over a medium heat and add 2 teaspoons sesame oil (to make oil-free sauté in a few tablespoons of water instead, adding more throughout as needed to stop sticking). Sauté the onions and ginger together until the onion is beginning to caramelize, then add the garlic and cook, stirring frequently, for another few minutes. Slit the lemon grass lengthways with a sharp knife then bash it with a rolling pin (it helps the flavour come out!). Add it to the pan with the the star anise and cinnamon then pour over the broth and tamari/soy sauce. Simmer for around 30 minutes then sieve it to remove all of the add-ins and return the liquid to the pan. Keep it on a low heat to keep warm. While the broth is simmering prepare your toppings. 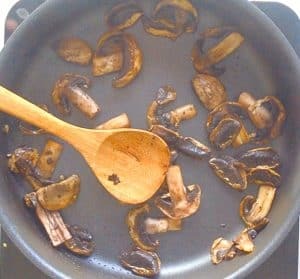 Wash and chop all of the raw veggies and sauté the mushrooms in the remaining 2 teaspoons of sesame oil until golden brown. Use water to sauté them to make oil-free. Once golden, remove from the heat and set aside. 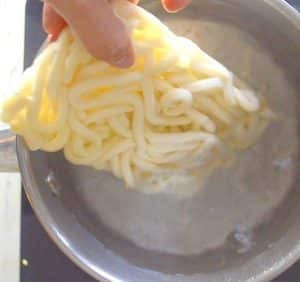 Bring a large pan of water to a rolling boil and cook the noodles as per the directions on the packet. When cooked, drain and rinse in cold water to stop them cooking any more. 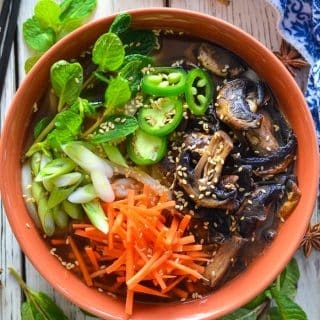 Assemble your bowls by putting noodles in the bottom, ladling over the hot broth, then covering with toppings of choice. Finish with an optional sprinkling of sesame seeds. The broth will keep for up to one week in the fridge and freezes well. Only cook as many noodles as you will eat as they do not keep well in the broth. They get too soft and a bit slimy. They are much better when cooked fresh each time and it only takes a few minutes anyway so it's no hardship. NUTRITIONAL INFO IS BASED ON THE ENTIRE RECIPE SERVING 5 PEOPLE AND DOES NOT INCLUDE THE SESAME SEEDS. Previous Post: « 39 Of The Best Vegan Cookie Recipes EVER! I made this–absolutely stellar. Going to make some more this week. 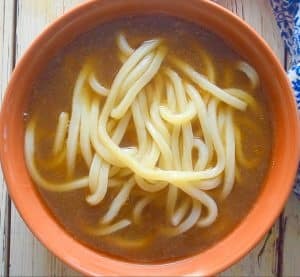 It’s especially nice to make the broth ahead and then just cook the noodles and assemble the soup when you want a quick, tasty meal. 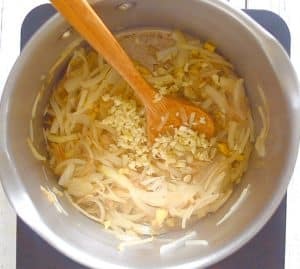 I add bean sprouts for texture and tofu for protein. The fresh herbs really elevate this from tasty to divine. Hi Anita. I’m so glad you enjoyed the soup and thank you for taking the time to leave a comment! Excellent! Very filling in itself and stuffed with lots of greens and other yummy goodies, yum!